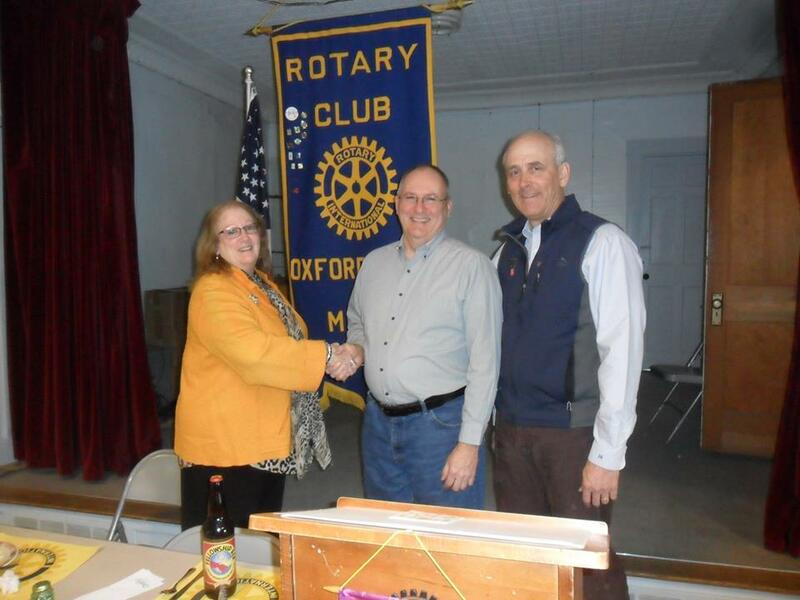 The Rotary Club of Oxford Hills is proud to announce the 2014 Rotarian of the Year (ROY) is John Griffith.The selection committee, made up of the last 3 year's recipients, reviewed 15 nomination papers, and made their decision and choice based on several criteria: 1) Attendance 2) Club project participation 3) Community participation both as a Rotarian and as a non Rotarian 4) Promotion of Rotary within the schools and community 5) Committee involvement and follow through and 6) Club office held, quality of work, and committees chair. Some of the quotes used as 2013 ROY Curtis Cole made the presentation: "this person has been amazing to our club all year!” Another reminded us that “this person participates in ALL club projects.” Still another said that “everything he says he will do, HE DOES!” So congratulations to John Griffith. John is retired from serving Norway Savings Bank for many years as a loan officer. He resides in Norway with his wife, Shelley. Shown in the photo left to right, President Christina Twitchell, John Griffith, and Curtis Cole. Congratulations John! !